NASA's Morpheus prototype lander rests on its launch pad waiting for a test at Johnson Space Center in Houston. Engineers at two separate NASA centers are hard at work developing futuristic robot landers with cutting-edge technology that could one day be used to take humans back to the moon or other destinations in the solar system. At the agency's Johnson Space Center in Houston, members of the Morpheus project are gearing up for two consecutive tethered tests of their robotic lander later this month. At the Marshall Space Flight Center in Huntsville, Ala., work is continuing on Robotic Lander Development Project after a successful free-flight test in June. 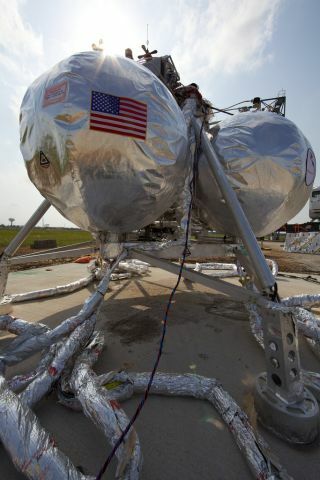 The Morpheus project resumed testing last month after upgrades were made to the lander's launch site to prevent grass fires, like the one that broke out during a tethered test on June 1, said Morpheus engineer Tim Crain. "Basically, it’s a set of independent power, radios and valves we can use to close off feed to the main engine to end flight if all else fails," Crain told SPACE.com. "We have three primary systems on the vehicle that do the same. This is all geared around ensuring safety for the JSC work force and surrounding population while we are doing low-energy free flights in Houston." Later this month, the Morpheus lander is expected to perform two consecutive tethered tests in which it will lift off from a concrete pad, hover to an altitude of about 98 feet (30 meters), and then land on another pad about 130 feet (40 m) away. The entire flight is expected to last about 60 to 70 seconds, and Morpheus will be tethered to a crane above for protection, Crain said. And while the landers are experimenting with advanced technology, the engineers are also being resourceful in their design of the futuristic craft. Crain has referred to Morpheus as "Home Depot engineering," but this has helped the project maintain a flexible test schedule. "One of the advantages of Morpheus’ project management and team approach is that we are very nimble and can change our flight test program as test results roll in," Crain said. "So these dates are what we are planning for now, but could change quickly." During the test, the lander ascended to a 6-foot (nearly 2 m) hover, and descended in a controlled landing. "With each test flight the lander is stabilizing, flying longer and demonstrating its control algorithms can maintain a stable attitude and execute a soft landing using the system's pulsing thrusters," NASA officials said in a statement. The prototype is also testing sensors, flight software and landing techniques that will allow the spacecraft to perform autonomous landings on airless planetary bodies in the solar system, when other options such as parachutes are not available.